Bruce and I had no clue what this special time of year would be like away from family and everything familiar. One of the big differences and something we both really missed was the lack of Christmas music. Even at church, there was no special program filled with hymns and scriptures about the birth of Christ. Another bi g difference we noticed was the lack of decor and lights everywhere. The Catholic Church, the largest building in town, had put up this interesting-looking tree and a rather bare manger scene in its large courtyard. 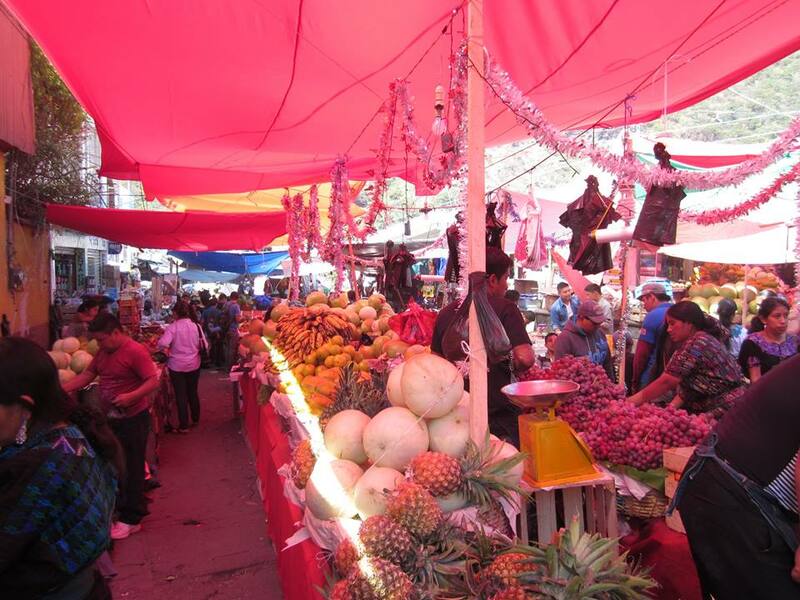 The mercado where local farmers and merchants go to sell their wares seemed more festive than anywhere else in town with this red cover giving off a pink glow in the sunlight. 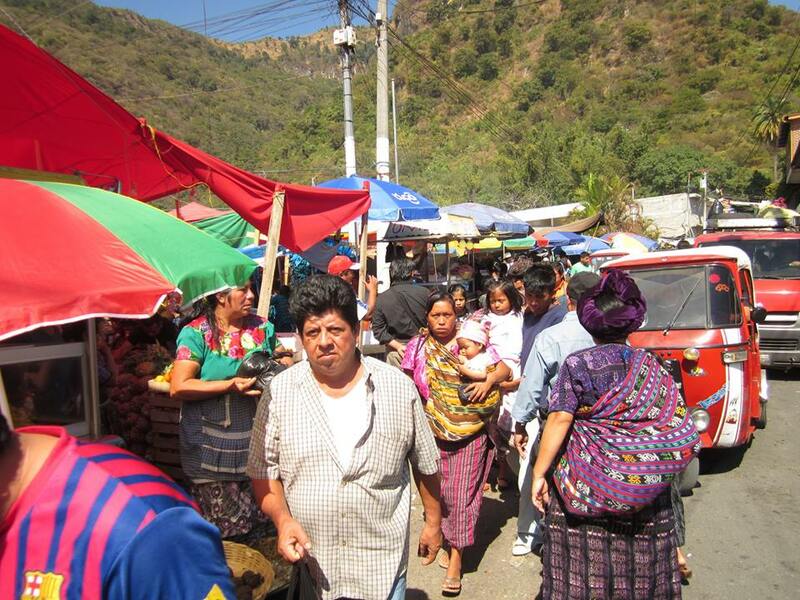 People are everywhere in the streets, especially on Christmas Eve day, crowding the mercado to get ingredients for the special meals served to family and guests. It seemed like food was more what people were shopping for more than last-minute presents. Making tamales in large quantities for friends and neighbors is a typical custom, and this requires fresh ingredients. I didn’t see many special gift items available except fo r baskets. Lots and lots of baskets filled with food items and packaged in bright cellophane. 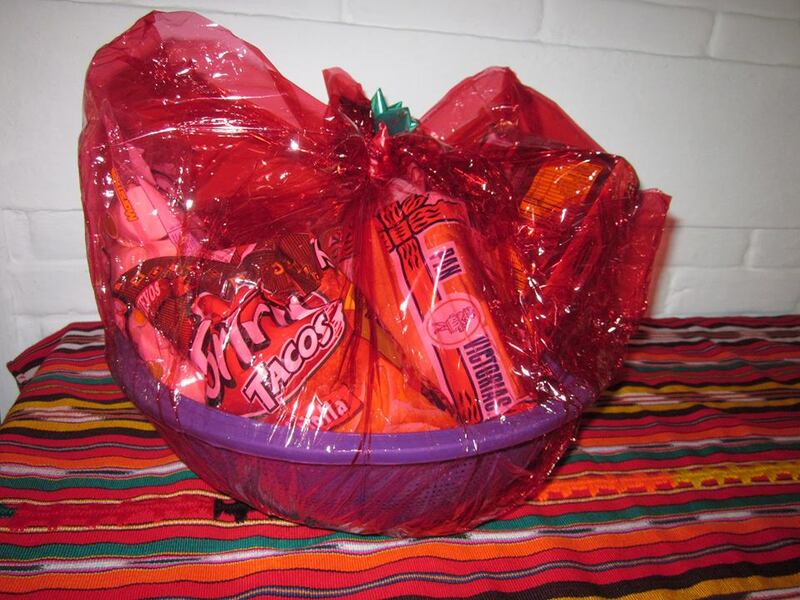 It’s a big thing at Christmas for companies to give these baskets to their employees. The contents are simple and basic yet people love them. The one at the right has a bag of chips, a half loaf of sandwich bread, a bag of marshmallows, a package of cookies, a half-liter of pineapple soft drink, and a baggie of grapes. These were ordered and delivered to Casa Colonial on Christmas Eve day. 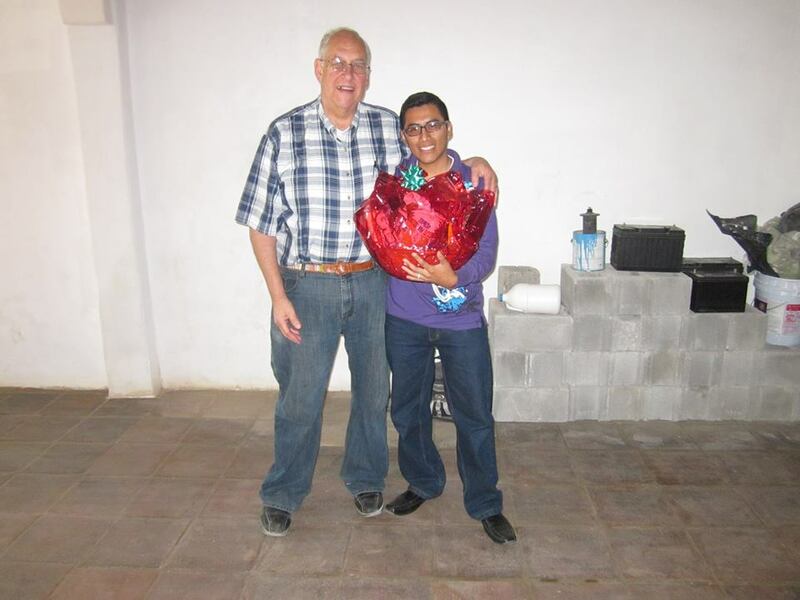 The hotel manager, Dagoberto, called everyone in to receive their baskets and then he took pictures. He had them pose with Bruce first handing the gift to each employee and then with Bruce having his arm around them holding the basket. Another huge shopping item is fireworks. Kids set them off in the streets in the weeks leading up to Christmas Day, intensifying on Christmas Eve. It was definitely not the silent night, holy night I always enjoyed in the States, but instead Christmas Eve was full of continual explosions as the firecrackers went off in every neighborhood throughout the night. Christmas Day was more of the same. As I’m writing this on the day after, it’s been relatively quiet for which I am very grateful. 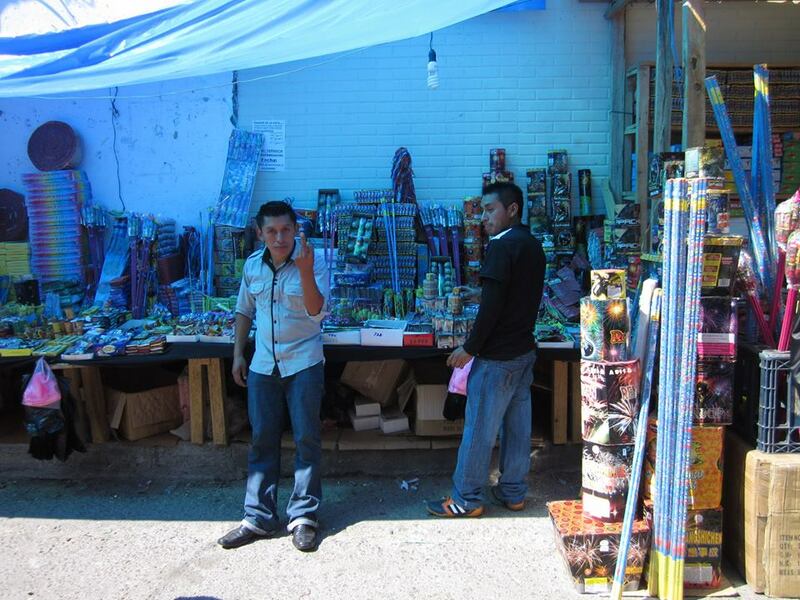 From the first week in December, stalls selling fireworks crop up everywhere along the streets. The one to the right shows an often typical response to tourists taking photos. Can you see what he’s doing? Yep, that’s right. He didn’t like seeing a camera pointing his direction. I get a little nervous taking photos for this reason and had asked my husband to go out and take pictures for this blog post. What a supportive guy he is! Bruce took this one from a tuk tuk, with the kid showing his disapproval. This man didn’t look too happy to have his picture taken either. In fact, tourists need to be careful about what they photograph and not take direct shots of the locals, especially not of their little children. I try to be more sneaky about it than Bruce, but then he’s twice as big as most of them. Generally it’s best to ask permission first, and if they say no, respect their wishes. Or if they hold out a hand, give them a couple quetzales. During the holidays in the States, cars clog the streets and parking lots and shoppers pack Target and Costco so you can hardly make it through the aisles. 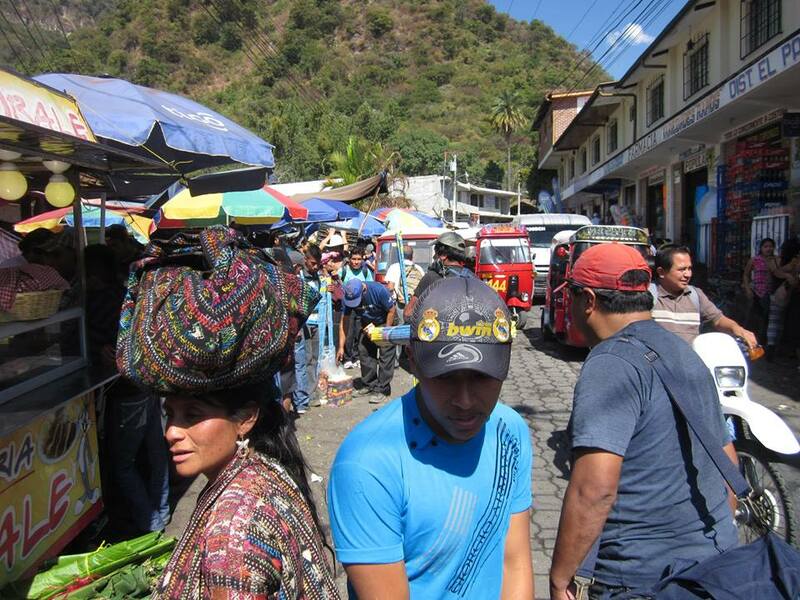 In Panajachel, the action takes place outdoors. Kids are setting off their firecrackers, adults are walking from place to place, tuk tuks line up to get fares. Parties take place outdoors as well, with streets often blocked off to traffic. Shopping, parades, school programs, whatever celebration or activity you can imagine during the holidays, and it’s happening outside. Of course the weather is perfect, with sunshine, warm temperatures and blue skies, just a little cooler in the mornings and evenings. No snow and cold or even rain in December, so it’s no wonder everyone wants to be outdoors. 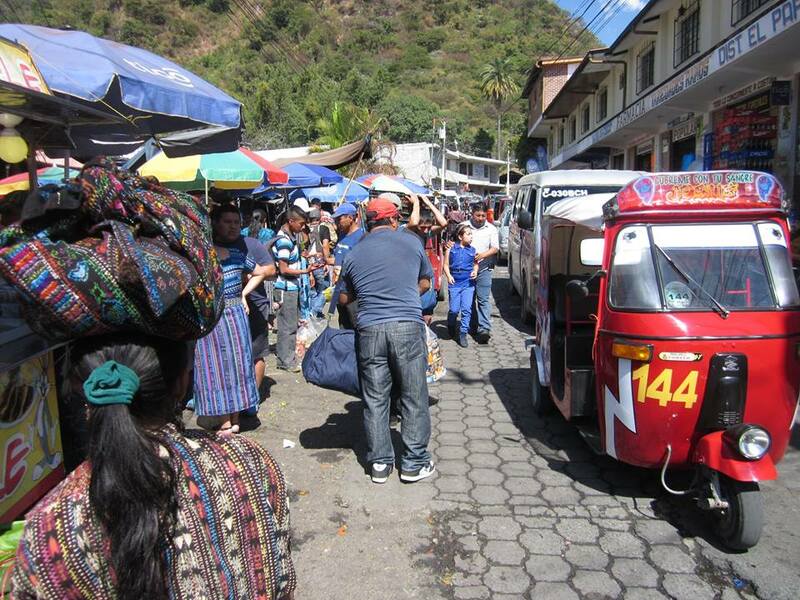 Besides, most Guatemalans don’t have large spacious homes with every convenience like we do in North America. A family of six may live in three rooms total, with a kitchen and laundry area outside, where they cook on an open fire and wash clothes by hand. Kids will go to an Internet cafe to use Facebook or play video games if they are lucky, paying by the hour to use the computers there. And with firecrackers abundant and cheap it’s no wonder they’re outside entertaining themselves with explosives instead of indoors playing video games. Kids as young as 5 or 6 are lighting matches and setting off fuses. Unfortunately, when they get too close they get hurt, and this time of year there are always kids rushed to the hospital with injuries. Bruce and I didn’t decorate or do anything special really, since we’d already had our Christmas in November when we traveled back home for three weeks. We spent time in Salt Lake City and also Colorado, seeing our family and giving them their Guatemalan presents. 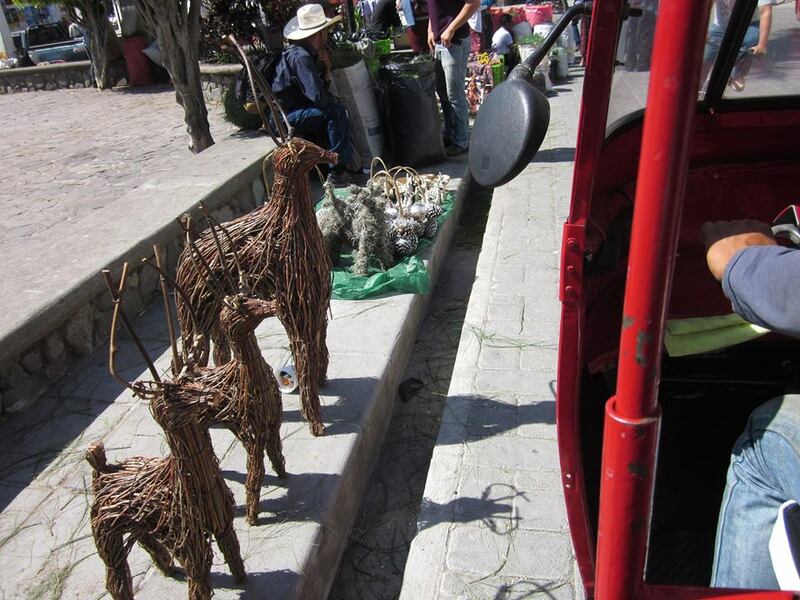 Although I kind of wish I’d bought these cool reindeer. Maybe next year. We were house-hunting in December and will be moving in a few days, so it wasn’t really a good time for decorating. 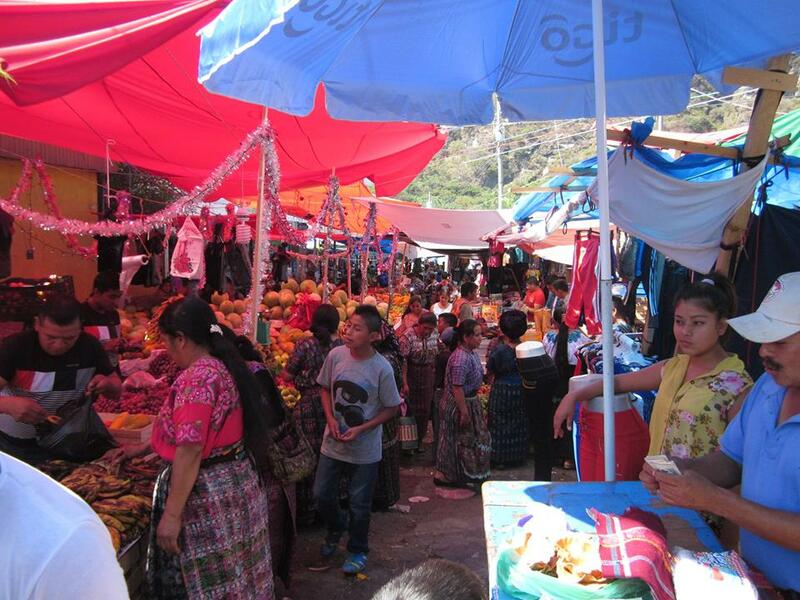 Our first Christmas in Guatemala was spent observing more than participating– overall a much different experience than any we’ve had in the past. 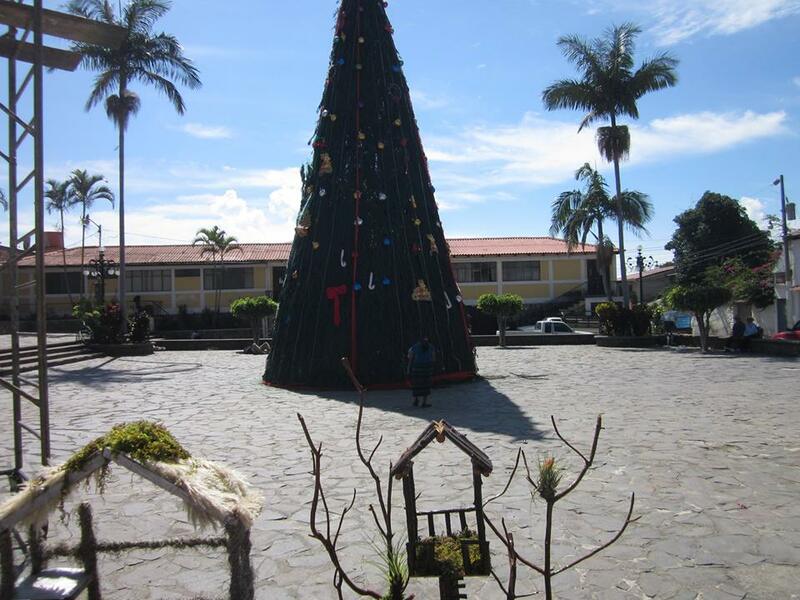 This entry was posted in Blog Posts and tagged Christmas, Christmas Day, Christmas Eve, Guatemala, Hotel Casa Colonial, Panajachel on December 26, 2014 by karenjonesgowen. It is good to realize the European model and its over-the-top North American version are not the only way it’s done. But it must have felt odd to you and Bruce. No music? That one I found rather sad. Merry Christmas, and here’s to an enlightening New Year! The lack of familiar Christmas hymns and popular songs (I love Bing Crosby at the holidays!) was definitely hard to get used to. What WAS over the top were the firecrackers. Explosions every five minutes was giving me a massive headache, even more than trying to navigate Costco in December. Feliz Navidad to you and Bruce! Sounds you have having a “bang up” time (so to speak) in Guatemala. I anticipated you would have a bit of culture shock, and I was not surprised. No white Christmas. No Bears hibernating in caves. I hope 2015 is a wonderful year for you, especially in your new home (please send pictures). Blessings and Bear hugs, as always! Thank you, Bear! Yes, definitely culture shock, more at Christmas than any other time, I think. Not surprising since holiday traditions are part of one’s psyche since childhood. Amazing what we take for granted and what we assume. Sounds like an interesting experience. Happy New Year – hope you find just the right house to make your home! Sure looks festive and warm. For our Christmas in L.A. I felt like I was observing more than participating, but there wasn’t as much family around for this holiday season so that was kind of a downer for me anyway.